By 2018, video will account for 79 percent of all consumer Internet traffic. In a world where social media is king with consumers spending an average of 3.6 hours on social media sites per day, it is important that businesses leverage social media at every point possible. 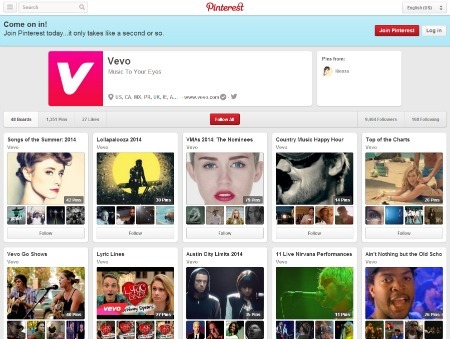 Vevo, a popular video hosting service, has announced its videos are now able to be shared on Pinterest. With 70 million active users, Pinterest is one of the largest active social networks on the Web today. The social media site sets itself apart from its social competitors by focusing on content discovery with its simple grid format. By adding Vevo to their repertoire, Pinterest adds yet another highly used video service to go alongside Vimeo and YouTube which were added in 2013. To “Pin” videos on Pinterest, users simply click the share icon located underneath all Vevo videos and then select Pinterest. Once videos are Pinned to the site users can watch the video without having to exit the site or its app counterpart.